India has something for everyone. From breathtaking snow-capped mountains in the north to pristine golden beaches in the south, India has it all. If you think you have seen everything, then you have another thing coming. This wonderful exotic land is filled with incredible and mysterious things that one can never imagine. Every corner of this beautiful country has something that has not yet been explored or discovered. If we go on digging the historic past of the country, we might never be able to accommodate all its charm at one place. However, with these bizarre locations, we bet you will be coming here again and again to explore these untouched, goose-bumping spots. Let's begin the journey! 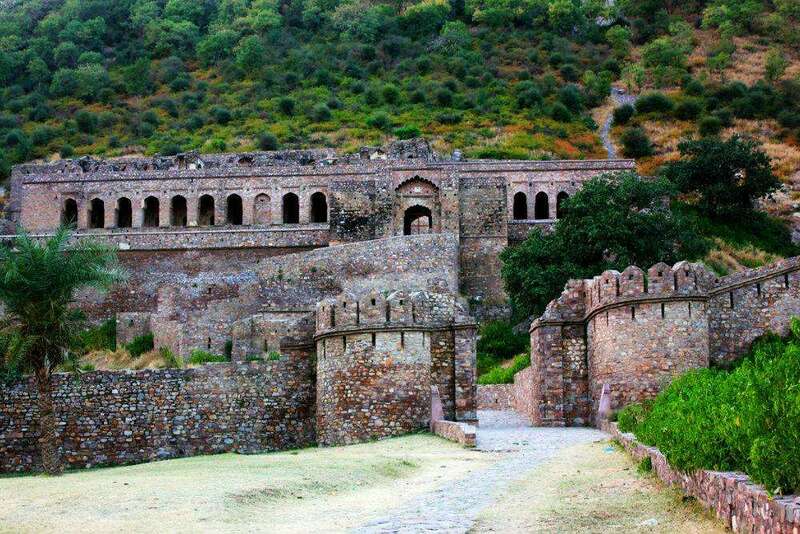 One of the most haunted places in the country, Bhangarh Fort is the place to visit if you are looking for an exciting and thrilling adventure. Situated in Alwar, there are many scary stories associated with this fort. According to the legend, there was a wizard called Singhiya who used black magic to make the princess of Bhangarh – Ratnavati marry him. On the day of the wedding, the princess saw through the magic and threw the portion on a stone, which killed the wizard. Upon dying, he cursed that the town of Bhangarh would be obliterated very soon. Locals believe that the current state of the fort is due to that curse and the ghosts of the princess and the wizard can be seen at night. It is because of this reason tourists are not allowed to enter the fort before sunrise and after sunset. Moreover, it is believed that anyone who has entered the fort at night has never been seen again. Situated at an altitude of 11,000 feet on the Leh – Kargil – Srinagar Highway, the Magnetic Hill of Leh is a gravity hill that has recently become a very popular stop among tourists on road trips. It is believed that the magnetic strength of this hill is so strong that it can actually push cars and other types of vehicles to the top of hill, even when the car engine is switched off. Moreover, some even believe that its magnetic strength is strong enough to even disturb the transmission of a low flying aircraft. The entire experience is quite thrilling, however, in reality, it is only an optical illusion that is caused by the alignment of the hill. Once you have visited this temple, you have truly seen the most bizarre place in the country. It is a temple in Rajasthan that is solely devoted to rats. Located in Deshpoke, about 30 kilometers from Bikaner, Karni Mata Temple is visited by thousands of devotees who believe that worshiping the rats over here is a way of getting blessed. Dedicated to Karni Mata, legend has it that her stepson – Laxman drowned while trying to get a drink of water from a pond over here. Karni Mata pleaded with the God of Death – Yama to revive him. Lord Yama conceded only on the condition that all of Karni Mata’s male children, including Laxman, would be reincarnated as rats. Home to more than twenty thousand rats, called Kabbas, Karni Mata Temple is a must visit for all those who love visiting eccentric attractions in India. Cherrapunji receives the highest amount of rainfall in India and thus, is also the most fertile land in the country. This can be seen from a set of natural root bridge, each of which are almost 6 inches thick and 18 inches broad and are actually strong enough to carry the weight of 50 people at once. Ficus Elastica or the Indian Rubber Tree has several secondary roots that extend for more than hundred feet. These have been manipulated by the people over here using beetle-nut trunks to form strong living bridges since the ancient times. The Umshiang Double Decker Bridge in Cherrapunji, Meghalaya is one such bridge and is a sight that you have to see it to believe it. Some of these root bridges are more than 500 years old. It has also been declared a part of the UNESCO World Heritage Site. Situated at an altitude of 6900 feet, Chembra Peak is the highest peak in the Wayanad Ranges in Kerala. It is only accessible by foot and you need permission from the forest office in Meppady to see this breathtaking natural wonder. However, the strenuous trek will definitely be worth it once you reach the lake. Halfway to the peak, you will find a beautiful heart shaped lake that will leave you completely breathless, literally and figuratively. The lake has become a major tourist attraction and it is believed that it has never dried up. There are many guides and trekking equipment available by the District Tourism Promotion Council for the comfort of the tourists. There is actually a restaurant in Ahmedabad – New Lucky Restaurant where you can eat lunch (or dinner) with the dead. Situated in Lal Darwaza in Ahmedabad, this interesting restaurant is constructed above a Muslim cemetery. The owner chose not to touch the graves but instead build the restaurant and its seating arrangements around the graves. It is said that they belong to a sixteenth century Sufi saint. The restaurant is very popular among the locals and the owner believes the graves are lucky for him. India has often been known as the ‘Land of Snake Charmers’ and this can be clearly seen in the small village of Shetpal in Maharashtra. Located in Sholapur District, Shetpal has a ritual that is not just exciting but frightening. Every house over here has a quiescent place for Cobras in the rafters of their ceilings. According to the legend, snakes are believed to be an icon of the revered Hindu god – Lord Shiva. However, what’s more interesting is the fact that no snake bites have ever been reported in this village despite them roaming freely over here. The small village of Kodinhi in the Malappuram District of Kerala has a strange phenomenon that has mystified scientists all over the world. With just a population of 2000, this tiny town has over 350 pairs of twins. That is more than one pair of twin in every family living in Kodinhi! Moreover, this rate is considered to be increasing every year and the most fascinating fact is that no one knows why this is happening. While India is considered low on the twin rate – just four pairs of twins out of every 1000 births, Kodinhi has 45 twins per 1000 births. Scientists reason that this could be due to some hereditary factor at work over here, but they are not sure. Similarly, Mohammedpur Umri Village near Allahabad has over 60 pairs of twins out of a population of 900, which is way more than the national average. Until researchers find out the truth, these two villages definitely top our most bizarre places to see in India. Situated at an altitude of 16,500 feet in the Chamoli District of Uttarakhand, Roopkund Lake is literally a spine-chilling lake located amidst the beautiful Himalayas. It is often called the Mystery Lake or Skeleton Lake. This is because more than 600 human skeletons were discovered over here. It is believed that a forest ranger while trekking found this lake in the year 1942. Most of these skeletons date back to the ninth century and are very clearly visible when the snow melts. Since, the lake is frozen throughout the year, one can only view them during the summer months. Some even believe that these skeletons belong to humans who were killed in a terrible hailstorm at Roopkund. India is known for its religious culture and values, but Bandai in Jodhpur takes it up a notch by offering prayers and liquor bottles to a motorcycle. It is believed that this bike belongs to Om Singh Rathore who was driving drunk and crashed his motorcycle into a tree. The police found the bike and took it the to station. However, next day when they went to see the bike it was not there and was found at the exact spot of the accident. They brought it back to the station again, drained the fuel and chained the bike. But miraculously, it was found again at the spot of the accident. No matter how many times they brought it to the station, the bike was found at the accident spot the next day. The motorcycle was then shifted permanently to that spot and a shrine called Bullet Baba Temple was erected over there. Many supporters and passersby offer their prayer to Bullet Baba as they believe that the spirit of Om Baba protect the travelers that are passing by. India is known for its mysterious and incredible tourist spots. These bizarre locations will keep you entertained and excited throughout your trip. Apart from above, other popular mysterious tourist destinations in India include Frozen Lake in Manipur, Floating Palace in Udaipur, Active Volcano in Andaman and Wasteland in Rann of Kutch.